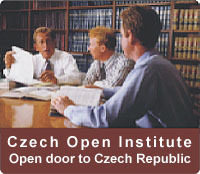 The Czech Open Institute was grounded in 1992 as an educational establishment of the Czech informational centre for the foreigners' integration. Its aim has been to help foreign citizens to overcome language barriers and inter-cultural differences. individual persons coming to seek help in the solution of their difficult situation where they had got into after having used services of various deceptive companies (these companies usually had promised work, education, residence permit etc., but they did not fulfil their promises). Thanks to this situation, the activity of the Czech Open Institute has increased - to the language teaching there was added an aid with university degree achievement, with looking for work and accommodation, with founding and development of private business activities etc. Experience acquired by the Czech Open Institute during ten years by solving these problems, has led to a decision - not to solve the problems caused by others, but to concentrate on their prevention. Based on a detailed review of the questions the foreigners have met and the services they were looking for but have not found, the Czech Open Institute opened three projects in 2002: Czechschool, Czechwork and Czechliving. These projects are assigned to all laborious, forceful and talented persons interested in acquiring an academic education or work in Czech Republic. Thanks to this fact, the Czech Open Institute develops two basic trends of activities now. The section for foreign workers preparation continues in its original orientation, i.e. helps the foreigners who already live and work legally in Czech Republic and need to learn the language or to understand Czech culture specifics. This section works for the clients among companies. The section for the foreign students acquisition and preparation offers its services to individual interested persons looking for complex services - from a help to gain the visa up to a preparation for academic studies, looking for work or private business foundation.